He was born Prince of Greece and Denmark, in Corfu, on 10 June 1921. His grandfather Prince Louis changed the family name to Mountbatten, after becoming a naturalized British subject in 1868. 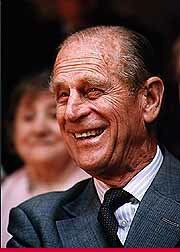 Prince Philip adopted the name for himself after he renounced his Royal title in 1947 and became a British subject. He was educated in France, England, Germany and lastly in Scotland where he attended Gordonstoun School, the school also of the Princes Charles, Andrew and Edward. He was a keen sailor at school and in 1939 he became a Cadet in the Royal Navy rising to the position of First Lieutenant. In 1947 his engagement to Princess Elizabeth was announced, and the wedding followed that same year, just a few months later on November 20. Although Lt. Mountbatten was appointed to Admiral of the Sea Cadet Corps in 1952, his Naval career came to an end in 1951. In 1953 he was appointed as Admiral of the Fleet. His wife was now Queen and he was created the Duke of Edinburgh and given the royal style His Royal Highness. Queen Elizabeth and the Duke of Edinburgh produced four children. HRH Prince Philip, the Duke of Edinburgh has many special interests including scientific and technological research and development, nature and the environment, and sports too. His love for nature is demonstrated through his active roles as the 1st president of the World Wildlife Fund and at one time the president of the International Equestrian Federation. HRH Prince Philip is a diverse man with widespread interests but he is also very devoted to the Queen and always accompanies her on her commonwealth tours and state visits overseas. He is Patron or President of many hundreds of organizations and charities, has Honorary Degrees from many universities and has obtained many foreign decorations over the years. Demonstrating his interest and support for young people, Prince Philip, in 1956, launched the Duke of Edinburgh�s Award Scheme which is aimed at people from all over the world between the ages of 15 � 25, testing the youngsters� ability in service, expeditions, skills and physical recreation.